As the opening line from the infamous book-turned-feature film The Blind Side goes: “from the snap of the ball to the snap of the first bone is closer to four seconds than to five.” The scene is set by taking us back to November 18th, 1985, to a memorable game between the Washington Redskins and the New York Giants. Legendary quarterback Joe Theismann hands the ball off to his running back before he gets it back on a flea-flicker. The rush gets home and defensive end Lawrence Taylor drags him to the dirt, resulting in one of the worst injuries in sports history. In an eerily similar fashion, 33 years later, Redskins quarterback Alex Smith was taken down to the turf, suffered the very same injury and suffered the very same 23-21 loss. Moments after the game, Head Coach Jay Gruden confirmed what everyone watching the game already knew; Smith had broken his tibia and fibula and would miss the rest of the 2018 season. Smith’s 11-week reign as Washington’s starting signal-caller was far from spectacular, but it was efficient, and off the back of a relatively strong running game and a little-bit-above-average defense, the Redskins were able to make their way to 6-3 and take first place in the NFC East. Smith entered the Week 11 matchup with an overall grade of 70.5, good for 23rd among the league’s signal-callers with at least 100 dropbacks and was looking very much like his usual, conservative self. 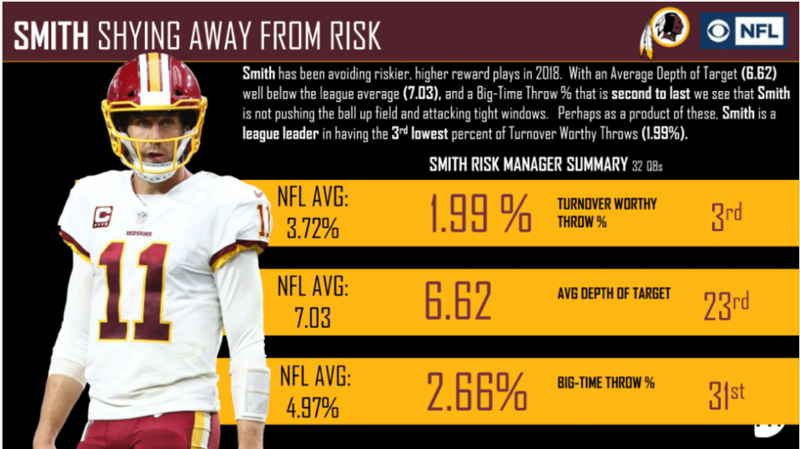 Through 10 games, Smith’s average depth of target sat at a lowly 6.62 yards downfield, which was good for 23rd among the league’s 32 starters at the position and his big-time throw (passes that are generally thrown further downfield and/or into tighter windows) percentage of 2.66% ranked 31st among the same group. His hesitance to attempt the same deep passes that littered his 2017 tape meant that he rarely put the ball in harm’s way, and prior to his final game of 2018, only 1.99% of his passes were deemed to be turnover-worthy – the third-best rate among quarterbacks. Smith’s performance in Washington was safe but relatively impressive when you factor in the season-ending injuries to the team’s offensive line, particularly to Brandon Scherff. In his time on the field, Scherff’s earned a pass-blocking grade of 82.0, which is currently the 13th-best mark among guards. Smith will end his first season in Washington ranked 28th among qualifying signal-callers in adjusted completion percentage (72.8%), 27th in passer rating under pressure (52.0) and 22nd in passer rating from a clean pocket (98.2). However, the biggest disappointment for Redskins fans will be his performance on deep passes (passes of 20-plus yards downfield), as his 73.4 passer rating on such throws ranks 25th among quarterbacks this year and is almost 60 points lower than his deep passer rating last year, in what was one of the best deep passing seasons that we’ve ever seen from a quarterback. Ninth-year quarterback Colt McCoy is the proverbial next man up for Washington, and the veteran performed relatively well in relief of Smith given the circumstances. The last season in which McCoy had any significant playing time was back in 2014 when he logged 150 dropbacks and finished with an overall grade of 61.5, ranking 26th out of 42 qualifying quarterbacks. His average depth of target that year was 7.05 yards downfield, compared to Smith’s 6.62 mark this season. McCoy had a big-time throw percentage of 3.13% in 2014, which is also slightly higher than Smith’s mark of 2.66% this year. In McCoy’s relief appearance against the Texans last Sunday, he earned an overall grade of 68.3, which was higher than Smith’s 62.6 grade for the game before his injury. McCoy’s higher grade is partly due to his mobility, as he gained 26 yards on three scrambles and forced two missed tackles. But McCoy also had one big-time throw on just 12 pass attempts, while Smith had nine on 328 pass attempts throughout the season. What should excite Redskins’ fans the most is that McCoy came in and took some deep shots, as he threw an average of 11.83 yards downfield, which towers over Smith’s 6.62 mark on the season. Yes, it’s a small sample size, but the numbers – and the eye test – show that McCoy is a little more willing to sling the ball and go for big plays. He’s a little less safe, but he should be able to produce more through the air. With the Redskins in a tight race in the NFC East, a few more big plays here and there can give the offense a much-needed boost to get to the playoffs. Colt McCoy just might be able to give Redskins fans one more thing to be thankful for on Thursday.